Gabe Whyte (Rufus Sewell) is about to leave for a convention in Princeton by plane. He still plays a game of chess with his son Erol (Haley Joel Osment) and says goodbye to his wife Marika (Gillian Anderson) in a loving way at the airport. But Gabe doesn’t return and leaves his family lonely and broken behind. A not ended game of chess is a lasting memory of him. About 12 years later after the mysterious disappearance of Gabe, we see Erol back as a mature 21 year old brainiac who excels in science and math. A gifted student who has probably inherited the genes from his family that consists entirely of academics and scientists. A traumatic event brings his grandfather Sal (Victor Garber) as far as to talk about the disappearance of his father and tells Erol his theory. Over the years Erol is more and more convinced that his father died. According to Sal, his son discovered an ability to travel back in time through so-called “wormholes” and wanted to meet Einstein in a parallel universe. So “I’ll follow you down” is about time traveling. It’s certainly not easy to come up with an original movie about that since there are already unmentionable films about this phenomenon (“Back to the Future“, “Looper”, “12 Monkeys“, “Terminator“, “About Time“, “Déja Vu“, ….) which are imbued with action to keep the attention of the audience in a grip. 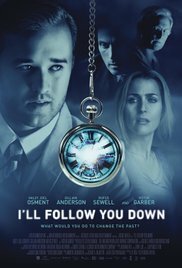 “I’ll follow you down” focuses on the scientific and emotional part of time traveling. Despite the lack of action or excitement it remains an intriguing SF questioning again the well known complications. What impact does a change in the past have on your present life? Will your personal situation still be identical in both family and professional way? It’s certainly not a flashy youthful SF adventure movie like “Back to the Future“! It’s still pretty clever of the director Richie Mehta to cast famous faces for this low-budget indie SF . An “X-Files“-like story deserves someone like Gillian Anderson, who indeed didn’t loose any of her good looks over the years. Haley Joel Osment who everyone knows as the endearing little boy who could see dead people in “The Sixth Sense” and who went looking for his real personality in “AI“. Besides the fact that he has gained some weight and has a goatee, you can still discern that angelic look in that bigger face. He can still look so sad with those puppy eyes. Especially Anderson delivers a brilliant performance as the depressed wife who lost her eternal love and never got over this loss so she got psychiatric assistance over the years and kept going with medication. Osment went on with his life and build a life together with his childhood friend. The disinterested gaze while his mother talked about his father and their first encounter, says enough. Unfortunately a big part of the film focuses on the relationships and what the possible consequences would be if Erol plans to travel to the past. Would it have an influence on his personal life ? The making of the time machine is limited to showing a welding mask, complicated mathematical formulas of quantum physics on a board and a small portion of a kind of diving bell. The display of the ultimate time travel itself is fairly limited and was at the time in the episodes of “Dr. Who “much better portrayed. It also bothered me that after the 12-year period Erol changed a lot, while his mother and grandfather still had the same appearance. Quite unbelievable. It’s not an action packed movie but has nicely detailed character studies and a terrible dilemma Erol has to make a decision about. Ultimately, it’s nothing more than a family drama in which the husband abandons his family, who are left behind with unanswered questions. In “I’ll follow you down” he wasn’t off to get cigarettes, after which he didn’t return. He just got stuck somewhere in the past. This Canadian film should certainly not be considered as a failure, but still it missed something and there was still a dissatisfaction that bothered me. It was as if I’ve looked an episode about traveling by train and there wasn’t even a fragment where you could see the train they were traveling with….